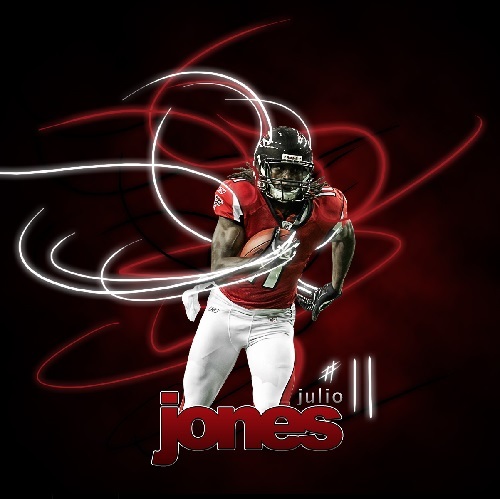 Since his arrival to the NFL we have marveled at the explosiveness, catching ability and tremendous athletic prowess of Julio Jones. He is now a step away from glory as his team the Atlanta Falcons prepare to play Super Bowl LI against the New England Patriots in Houston, Texas. With his hands he helped resurrect a collegiate program and he is now getting ready to help his NFL team win the biggest football game in franchise history. Quintorris Lopez Jones was born in Foley, Alabama came into the world on February 3, 1989. His first name means Gladiator and “Julio” was the nickname his mother, Queen Marvin, gave him during his childhood in honor of a friend. At an early age, he witnessed the divorce of his parents. When his father left home, Julio, with great determination, reassured his mother, telling her that everything would be all right, that he would grow up to be a football player and the family would move on. Queen Marvin was a very responsible woman, working long hours to support her family. Her biggest goal was keeping the future Falcons’ receiver away from problems, conveying the value of responsibility that has guided Jones through his sports career. Upon entering Foley High School, Jones enrolled as a running back and defensive back, but as he grew taller and developed physically in his sophomore year, he was allowed to make the transition to wide receiver. He performed exceptionally well finishing the season with 51 receptions, 805 yards and eight touchdowns, which earned him national recognition. In his junior year, he caught the attention of the best collegiate programs thanks to his 75 receptions, 1306 yards and 16 touchdowns. The best collegiate coaches were witnesses to the talents of the young Julio, including Urban Meyer and Nick Saban. The latter had just signed with Alabama and was looking to recruit the foundation of his successful program. Many promised the receiver a starting role, but not Saban. When they met in an interview, the coach told him Alabama would win with or without him on board; this response was just the one that Julio wanted to hear, convincing him that the Crimson Tide was the right program to choose to grow and develop athletically. On National Signing Day 2008, Jones announced his choice, marking the start of a new era for the University of Alabama and the Crimson Tide Football team. With Jones in his freshman year, Alabama went undefeated in the regular season with a 12-0 record, but fell to the Florida Gators of Urban Meyer and Tim Tebow, eventual National Champions in 2008. However, it was not long before Jones would win his first National title. In 2009, with running back Mark Ingram in his Heisman campaign, Nick Saban’s team dominated the SEC conference and was finally able to conquer national glory, while Jones positioned himself as one of the best prospect for the NFL draft. In 2010, after Cam Newton snatched the SEC title from Alabama in the memorable Iron Bowl, Jones decided to put aside his last year of eligibility to become professional and achieve the dream he promised his mother. Everyone was interested in Jones, but Thomas Dimitroff, general manager of the Atlanta Falcons, was fascinated by Jones’ potential as a dominant wideout in the NFL over the next decade; the big problem is that he needed to trade up to get a chance to choose Jones as a top 10 pick. Dimitroff turned to former employer Bill Belichick for advice. The coach and manager of the Patriots was “brutally honest” about Jones, noting that it was a considerably risky move. Belichick said in fact that it was kind of trade that could cost a general manager his job and stressed that Jones had difficulty separating himself from defensive players and that his hands were not good enough to justify pulling the trigger on such a trade. Fortunately, Dimitroff ignored Belichick’s advice. When the 2011 draft came, the Falcons were aggressive and managed to climb to the sixth spot, paying the expensive amount of five draft picks, including two first rounders, to get to Jones. Once again, the future of an organization was in the hands of “the Gladiator”. Ever since he set foot in Atlanta, the Falcons and Thomas Dimitroff have been all smiles as Jones has in fact developed into one of the most dominant players in the league. Since he began his NFL career Jones has played in four Pro Bowls, was chosen to two First All-Pro teams, he became the NFL’s receiving yards leader in 2015 and has played in two NFC Championship games. His humility and work discipline have kept him out of trouble making him an excellent example and influence for other young receivers such as Mohamed Sanu and Taylor Gabriel. Throughout his career he’s averaged 15.3 yards per catch, while accumulating 497 receptions, 7610 yards and 40 touchdowns. As he finally sees his dreams come true Jones hopes to finally cap it all by winning Super Bowl LI for his mother, the Falcons and the fans in Atlanta.